T'Challa was born to be the King of Wakanda, a hyper advanced African nation. After the death of his father and successfully completing his rite of passage, T'Challa rose to full power as the Black Panther. Equipped with superhuman abilities and his incredible vibranium suit, this hero makes his live-action film debut in MCU film Civil war, standing on the side of Iron Man in his dispute with Captain America. 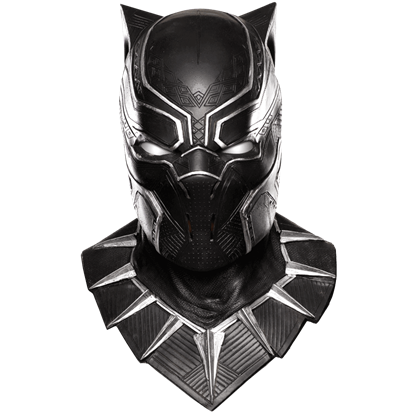 For all fans of Black Panther, Superheroes Direct supplies collectibles for long-time enthusiasts and Marvel fans impressed by his role in Civil War. 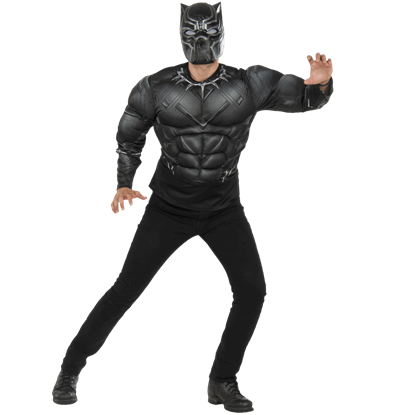 We offer a variety of Black Panther apparel, including t-shirts depicting his logo and character in an action pose, as well as a costume shirt meant to mimic his vibranium suit. POP figures and other collectibles are the perfect way to show off your love of this iconic superhero. 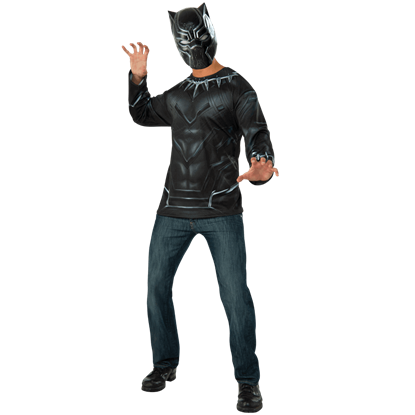 Become Black Panther with both style and ease when wearing the Adult Black Panther Costume Top and Mask Set. This set includes his feline-featured mask and a long sleeve shirt that imitates the appearance of his sleek black super suit. 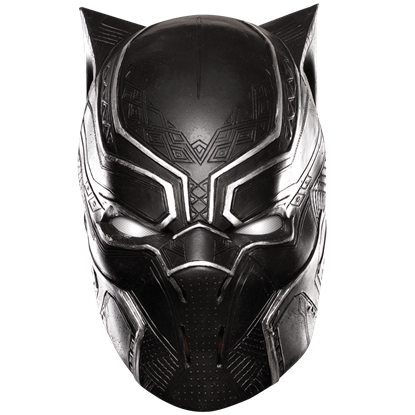 Made of high quality material with intricately cast details, the Adult Black Panther Overhead Latex Mask is a remarkable way to transform yourself into the Wakandan prince turned superhero as he appeared in Captain America Civil War. Black Panther made his cinematic debut in Captain America Civil War when the prince of Wakanda took on this heroic role. With the Adult Civil War Black Panther Full Mask, you too can make a scene dressed as this Marvel superhero. Feel the power of the Wakandan prince turned superhero in your hands when you wear the Adult Civil War Black Panther Gloves. 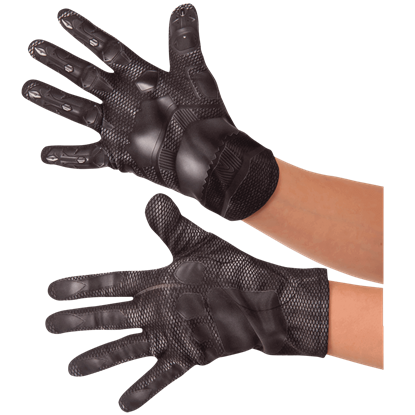 Officially licensed, these gloves are inspired by his sleek super suit as seen in Captain America Civil War. Step out from the shadows in style when you wear the Adult Deluxe Black Panther Costume. Making his movie debut in Captain America Civil War, the Prince of Wakanda turned superhero is the inspiration behind this licensed ensemble. 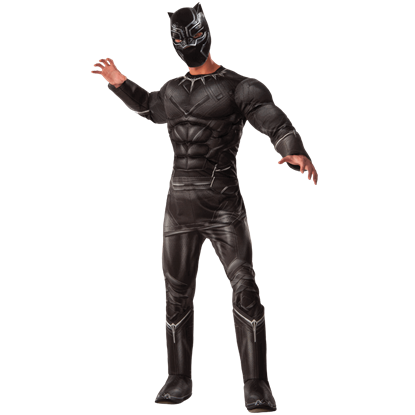 Based on his sleek, Vibranium-laced super suit as seen Captain America Civil War, the Adult Deluxe Black Panther Costume Top and Mask are perfect for effortlessly achieving the look of the Wakandan prince turned superhero. 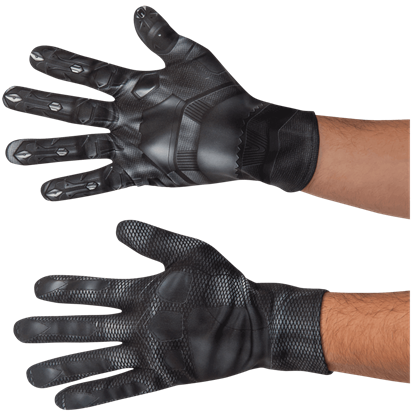 If you sense your Black Panther outfit is missing its edge, the Adult Deluxe Black Panther Gloves are perfect for adding that extra fearsome detail to any look. These costume gloves feature plastic claws at the tip of each finger. Human on the outside, predatory hunter of evil forces on the inside, the Black Panther exhibits finely tuned hunting and tracking skills. 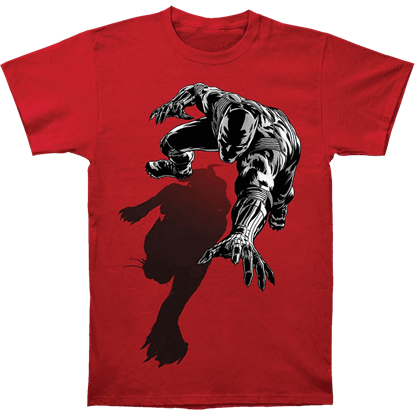 The Black Panther Shadow T-Shirt sheds light on the feline instincts of this Marvel superhero. 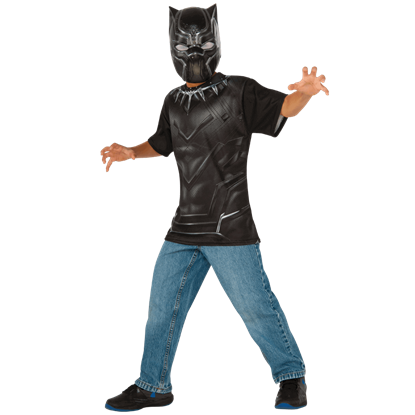 Let your child channel the powers of the fierce Wakandan prince Tchalla by wearing the Kids Black Panther Costume Top and Mask Set, perfect for effortless dress-up. This set includes a t-shirt style costume top and a mask. Now your child can transform themselves into the powerful superhero Black Panther when wearing the Kids Black Panther Full Vinyl Mask. Made of vinyl, this full mask covers the face with its sleek black and white details. Your child will have the very power of this Wakandan prince in the palm of their hands with the Kids Civil War Black Panther Gloves. Featuring fantastically printed design details, these costume gloves are officially licensed. The might of any jungle cat rests in its claws, and the Kids Deluxe Black Panther Gloves depict this weapon of choice for the fearsome superhero who made his cinematic debut in Marvels Captain America Civil War movie.